What better way to spend the summer than with a flock of friendly sheep? Perhaps a clutch of newly hatched chicks? A little ukulele? Salmonberry School has reached the halfway mark of its summer program offerings with resounding plaudits from the Orcas Island community. And one glance at the calendar tells the story: Traditional Woodworking: FULL. Chickens 101: FULL. Music and Storytelling: FULL. Arts Around Orcas: FULL. Sheep 101: FULL. Salmonberry’s array of fun and focused summer classes, introducing kids age 3-12 to a wide range of traditional arts and craft has captured the imagination of island parents and children alike. Last week 16 students spent a week with half a dozen sheep and lambs. They visited with them each day and learned their names, breeds and personalities. They learned all about sheep biology, life cycle, and husbandry, and then focused in on wool and fiber. They got to try their hands at all stages of fiber-arts production. They sheared sheep, washed, carded, and spun wool with a drop spindle. They dyed wool in Kool-Aid. They learned to knit. And they had an incredible time in the process. 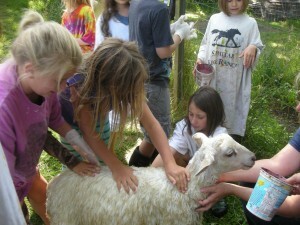 A totally immersive experience, these kids kept sheep journals, read sheep stories and created woolen art of every kind. Next week, Salmonberry’s Art teacher, Andrea Cohen will take students on a plein-aire journey around the island. Students will take sketch books into the forest, easels into farms and fields and even try a little found-object en plein-aire collage! They will also visit local artists’ studios to see professionals plying their craft using a wide range of media. Earlier this summer, music educator and professional musician and storyteller Tom Rawson visited from Seattle to teach a week-long ukulele based music intensive. Again the experiential learning was profound, and FUN! “ ‘I wish I could go to this week of camp,’ is a common refrain heard from parents” according to Sheep 101 and Chicken 101 instructor Amy Lum. 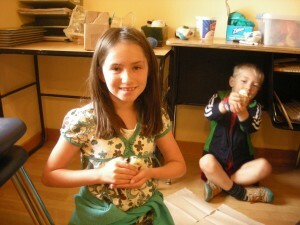 “This is so awesome!” is how one of the students described their week of Salmonberry Summer Camp. And remember, quality experiential and immersive learning shouldn’t be just a summer thing. Salmonberry students love coming to school and that opens up possibilities you can’t imagine!